Golden Richards is just like your average guy. He worries about money, getting older and trying to avoid a mid-life crisis. The kicker? Golden is the titular polygamist with 4 wives and 28 children (+ or - a few stillborns and miscarriages). And as one might expect, life in the Richards house (or houses as the case may be) can get a little chaotic. The book focuses on just a few characters in the house - Golden, his 4th wife Trish and son Rusty. Each family member has their own proverbial crosses in life to bear - Golden tries hard to live his life by the Principle, desparately trying to avoid an affair with his boss' wife. 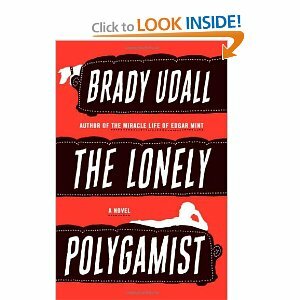 Trish struggles with the loneliness comes with being part of a polygamist family. And Rusty just wants to be noticed and not humilated on a daily basis by his obscenely large family. Udall's book is funny and just an overall a good story about the American family. Fans of the TV show Big Love will probably enjoy it.